^ The Literary Works of Machiavelli, trans. J.R. Hale. (Oxford: 1961), p. 139. Baron, Hans. Machiavelli: the Republican Citizen and Author of The Prince. English Historical Review. 1961, (76): 217–253. Donaldson, Peter S. Machiavelli and Mystery of State. Cambridge University Press. 1989. Ingersoll, David E. The Constant Prince: Private Interests and Public Goals in Machiavelli. Western Political Quarterly. December 1968, (21): 588–596. Magee, Brian. The Story of Philosophy. New York: DK Publishing. 2001: 72–73. 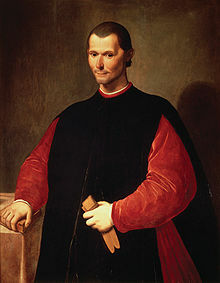 Najemy, John M. Baron's Machiavelli and Renaissance Republicanism. American Historical Review. 1996, (101,1): 119–129. Parel, Anthony. Introduction: Machiavelli's Method and His Interpreters. The Political Calculus: Essays on Machiavelli's Philosophy. Toronto. 1972: 3–28. Pocock, J.G. A. The Machiavellian Moment: Florentine Political Thought and the Atlantic Republican Tradition. Princeton. .
Soll, Jacob. Publishing The Prince: History, Reading and the Birth of Political Criticism. University of Michigan Press. 2005. Sullivan, Vickie B., ed. The Comedy and Tragedy of Machiavelli: Essays on the Literary Works. Yale U. Press. 2000. Sullivan, Vickie B. Machiavelli's Three Romes: Religion, Human Liberty, and Politics Reformed. Northern Illinois University Press. 1996. Viroli, Maurizio. Niccolò's Smile: A Biography of Machiavelli. Farrar, Straus & Giroux. 2000. Whelan, Frederick G. Hume and Machiavelli: Political Realism and Liberal Thought. Lexington. 2004. Wootton, David, ed. Selected political writings of Niccolò Machiavelli. Indianapolis: Hackett Pubs. 1994. Dirk Hoeges, Niccolò Machiavelli. Dichter-Poeta. Mit sämtlichen Gedichten, deutsch/italienisch. Con tutte le poesie, tedesco/italiano, Reihe: Dialoghi/Dialogues: Literatur und Kultur Italiens und Frankreichs, Band 10, Peter Lang Verlag, Frankfurt/M. u.a. 2006, ISBN 978-3-631-54669-7.